Beside selling copies of the graphic novel series, Eye Witness (books 1 & 2: http://www.headpress.info/ ), Head Press Publishing will be offering a convention exclusive at this year's Comic-Con International 2007, in San Diego from July 25th-29th, (to purchase advance tickets go to: http://www.comic-con.org/ ). But this years booth promises to be even more special than in year's past, because HPP will also be the home for a handful of carefully selected RED-HOT Christian themed entertainment items, that will available nowhere else at the convention! -The EXCLUSIVE COMIC-CON ashcan edition of, EYE WITNESS: DESTINY ROAD. This is an advance sneek peek at the third and final book in, Robert James Luedke's, Award-Winning Eye Witness Christian graphic novel series. There will be a limited edition of 100 signed and numbered copies available on a first come first serve basis....so visit us as early in the con as you can before they are gone. The finished 160+ page graphic novel will be ready in time (hopefully) for CCI '08. -NEVER CEASE, a novel by Sue Dent (http://www.shoutlife.com/profile_view.cfm?uid=2236 ). A vampire and a werewolf....can the two who were wronged make it right by their faith? Find out in this highly praised horror novel with a Christian foundation. Never Cease, was on the peliminary ballot for the Bram Stoker awards, (http://www.horror.org/stokers.htm ), in the catagory of Superior Achievement in a First Novel & was named Book Club Choice of the Month (in April '07) by the American Christian Fiction Writers (ACFW: http://www.americanchristianfictionwriters.com/). 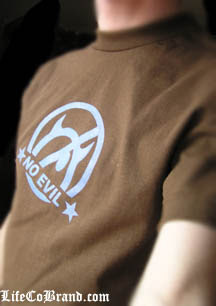 -T-Shirt creations by Life Co Brands (http://lifecobrand.com/shirts.php) ...featuring their NO EVIL & I KILLED JESUS designs. 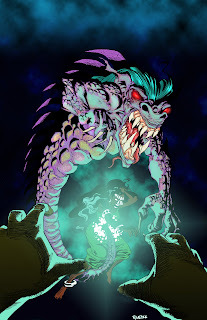 -The wonderfully irreverant and cutting edge anthology magazine, MEGAZEEN (http://www.megazeenonline.com/ ), which features some of the most talented creators working in the genre of Christian comics today. 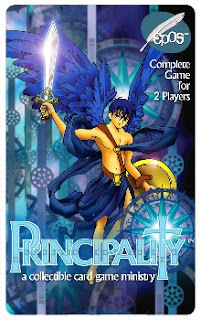 -and....For the gamers out there we will feature the PRINCIPALITY collectable card game by EPOS, (see: http://www.epos-ent.com/Principality/). We will have both master decks, (which has everything you need for a 2 player game) and also the A CHOIR OF ANGELS EXPANSION PACKS. So don't miss out on stopping by and taking a look at all these wonderful products. Like last year Head Press Publishing be located right next to the Christian Comic Arts Society (CCAS: http://www.christiancomicarts.com/ ), so our little corner of the Small Press Pavillion will be guarenteed to be the center of the Comic-Con universe for Christian oriented products and creators! 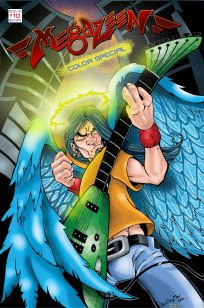 And speaking of the CCAS, they will be sponsoring a SPIRITUAL THEMES IN COMICS PANEL, (on Sat. 7/28, from 10:30-11:30am and the CCAS PANEL & CHAPEL SERVICE (Sun, 7/29, 10:30-11:30a). Author and Artist of the Eye Witness series, Robert James Luedke, (http://www.headpress.info/about_luedke.html ), will be on hand for the entire convention, signing autographs, working on pages from Destiny Road, drawing sketches and in general talking to fans about: creating comics, writing, inking, composition and using graphic arts in ministry....so make sure to stop by and say hi.